It’s game day here at spalanz.com, and it’s time to look at another expansion to that deck-building classic Thunderstone – we’re heading to the Thornwood Forest in search of the Stone of Blight! Thornwood Siege was released in 2011, and is the fourth expansion to the game, coming out after the big-box expansion Dragonspire. While there is a level of thematic expansion here, as we get some hero types who have more of a woodlands-theme to them, in the main this is very much a “more of the same” type of expansion for the game, with a lot of the sort of generic items and spells that would be playable in any game of Thunderstone. The heroes include the Krell that features one of the rare – if not the only – hero type that can be levelled up four times rather than the usual three. The others, as I say, are fairly standard fare for the game at this point. It’s a similar story with the village items, though with some twists such as the Guiding Light magical item that gives all players a universal +1 light for the rest of the round if you defeat a monster while it is in play. However, while this feels like a very co-op orientated idea, there is also the Stalking Spell spell that forces other players to enter the dungeon on their turn, which can be used in a very player-vs-player way. It’s also worth mentioning the Time Bend spell, which lets you keep an unused card from your hand to add it to your next hand. This tempo-shift comes into play more strongly with the new monster mechanics (more shortly), but it’s something that’s always useful to have in deck-building games! The new mechanics, however, are featured on the new monster cards we get in the expansion: Raid and Stalk. Raid is a new mechanic that represents the raiders coming out of Thornwood Forest to, well, raid the village. The mechanic forces you to destroy cards from the village stacks, meaning that over time there will be fewer items to choose from. They tend to destroy the most expensive cards as well, adding some pressure if you want to save your gold to get the good stuff! 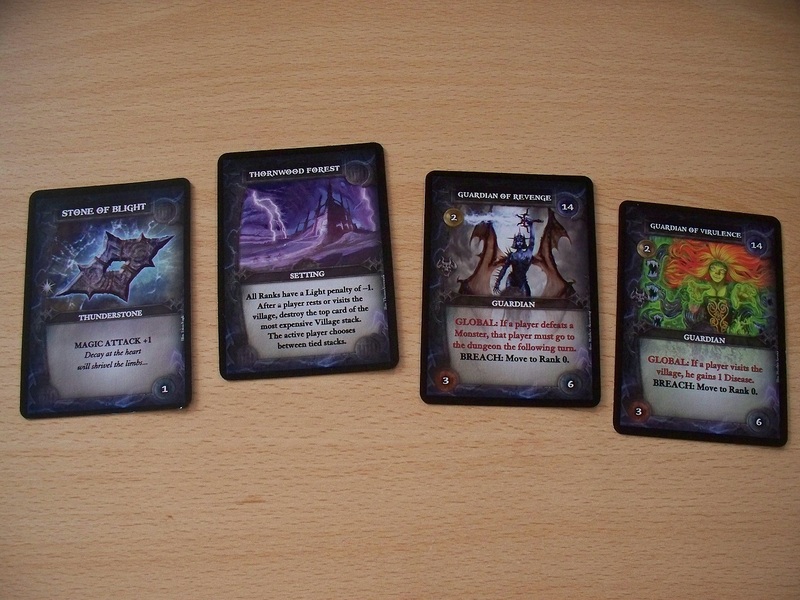 There are also Siege cards that function in a similar manner if they breach the dungeon hall, for instance, further adding pressure to the game. Stalk is a keyword that will take effect on your next turn, adding to the tempo-shift mechanics mentioned earlier on the Time Bend spell card. When you reveal a monster with the Stalk mechanic, you take a token that matches the card’s effect, and then proceed with your turn as normal. Then, on your next turn, you suffer the effects of that token (or tokens) at the beginning of your turn. It’s an interesting sort of mechanic that plays around with the established turn structure, at any rate. Thornwood Siege, while offering much of the same in terms of game content, is still a fairly decent expansion to the game. 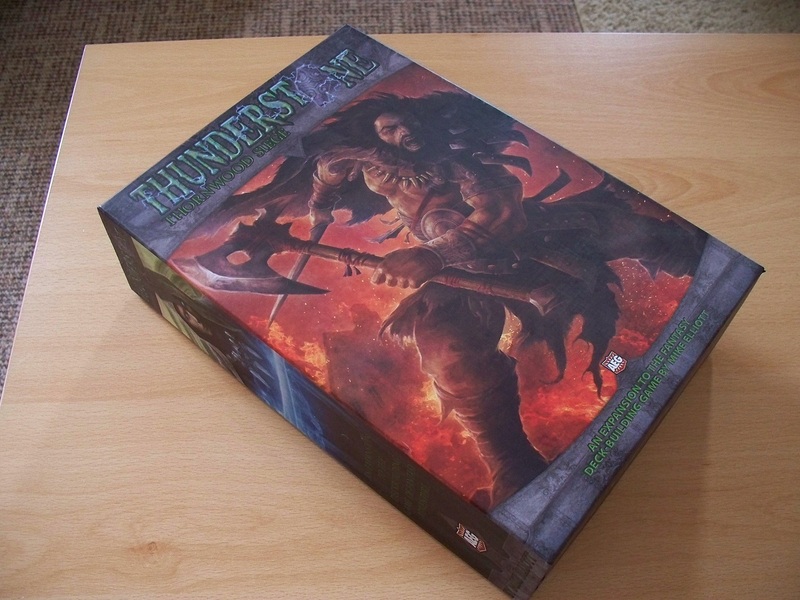 Of all of the original line of Thunderstone expansions, this one is weirdly the one still most readily available (at the time of writing this blog, at least), which perhaps leads me to think it didn’t sell so well? 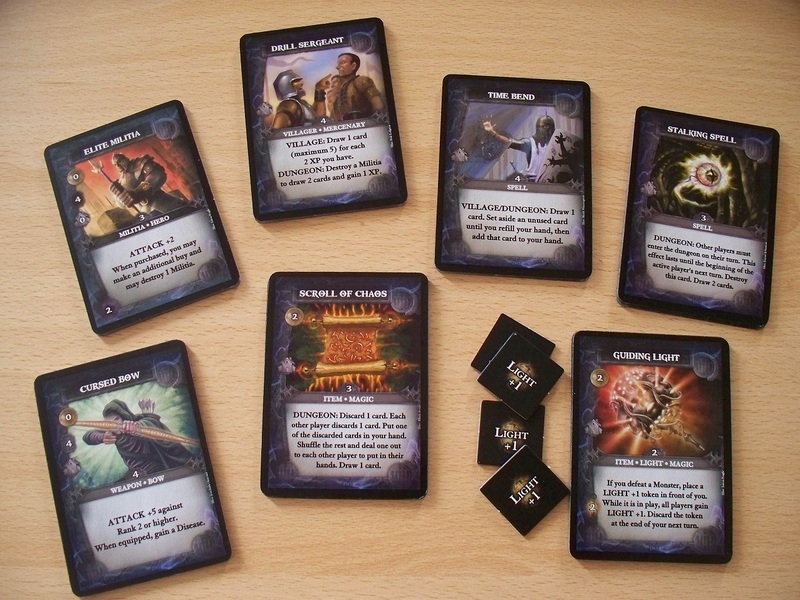 Thunderstone still has one expansion left for me to feature here, at any rate, so hopefully soon I’ll get round to the final battle at the Heart of Doom! Stay tuned for that! 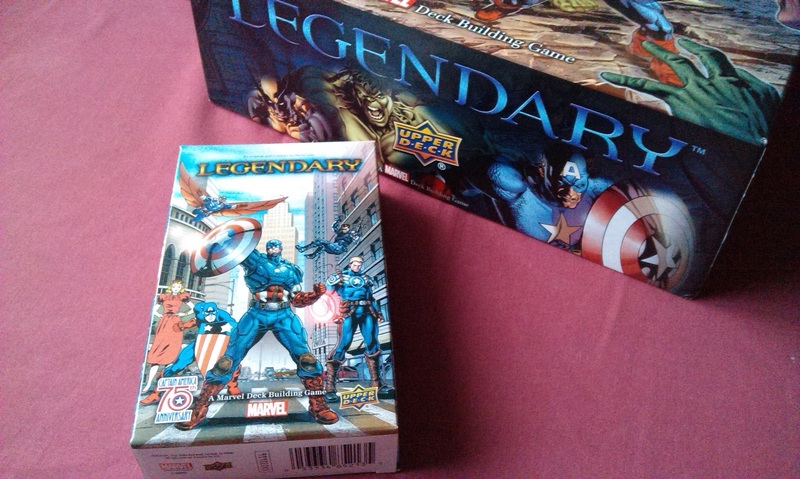 It’s time for game day here at spalanz.com, and today I’m showcasing another game that I had for Christmas, one that was released back last Spring: it’s the Captain America 75th Anniversary expansion for Marvel Legendary! Time for a little history, I think. Captain America first hit the comic book scene in March 1941, designed from the outset as a patriotic supersoldier to help wartime morale, as readers saw him fighting the Axis powers in the trenches. Post-war, he was discontinued from 1950 until his return in 1964 under the authorship of comics legend Stan Lee, and has remained in publication ever since. In 2007, Captain America was killed, and Bucky (Winter Soldier) takes on the mantle of Cap. Some time-shift shenanigans allowed him to come back from the dead in 2009, but the supersoldier serum that made him so powerful was neutralised in 2014, causing him to age rapidly, and Falcon took up the mantle of the first avenger. 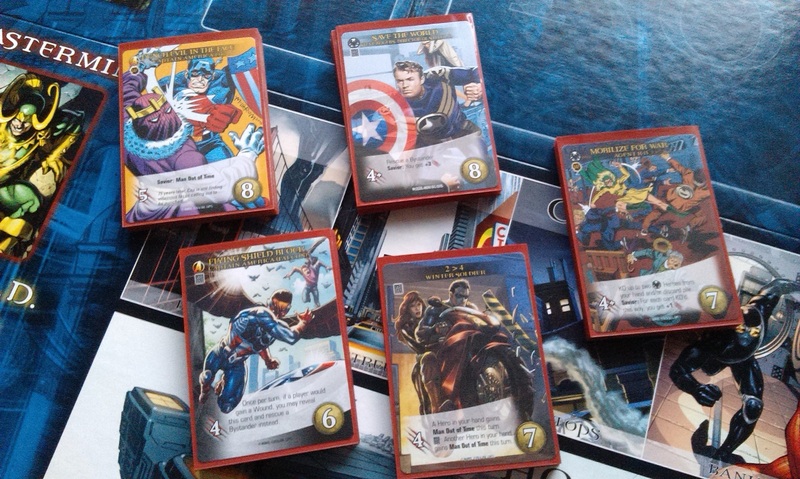 It’s been a long and distinguished career for Captain America, and to mark the 75th anniversary of his arrival on the comics scene, Upper Deck released the small expansion to commemorate that, bringing some of that history to the game with Winter Soldier, Betsy Ross and the Falcon’s incarnation as Captain America. There are, of course, new keywords to go along with all this stuff. Man (and Woman) Out Of Time is very similar to Teleport from Dark City, allowing you to set up combos with your cards. However, unlike Teleport, where you just set the card aside until your next turn, Man/Woman Out Of Time lets you play the card, then put it aside to play it again on your next turn, getting more value out of the play. 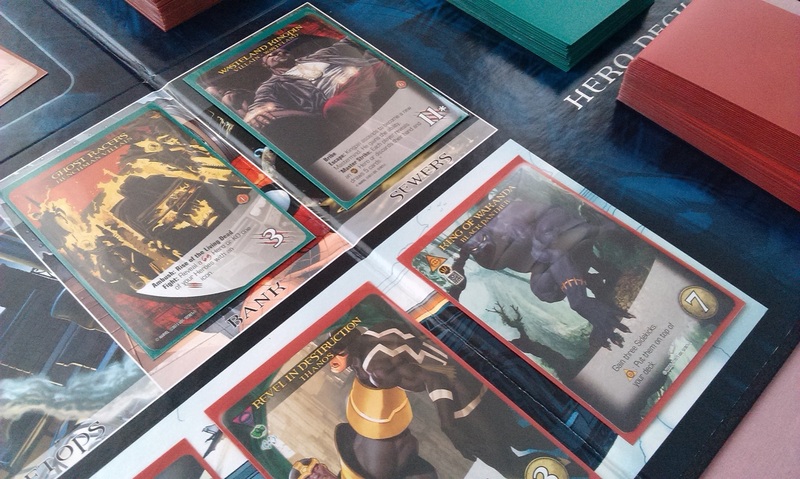 It’s a really nice concept, but it can lead to some pretty good combinations going off – in my first game I used Winter Soldier with Black Panther, and the two allowed me to draw so many cards, it was insane! Saviour is the second hero-centric keyword, which reflects Captain America’s protection of the ordinary folks. If you have 3 or more saved Bystanders in your victory pile, the Saviour keyword triggers, which might be drawing cards or whatnot. It’s a really thematic ability to have in a Captain America set, anyway! Saviour also brings us on to the villains of the set. We get two, Arnim Zola and Baron Zemo, the latter’s strength being Saviour-dependent. I could be wrong, but I feel that Zemo is possibly the first mastermind that could be nigh impossible to beat unless you have specific heroes in your deck, as his health is 18 unless you have 3 Bystanders in your victory pile. He always leads the Masters of Evil (WWII), all of whom have the ambush effect of capturing a bystander, which builds-in a possible way to get Bystanders, but with the wrong cards, you’re left with a very luck-dependent game. (That said, in my game I was playing with the Captain America (Falcon) hero, who has a lot of ways to rescue Bystanders, so when Saviour hit, Zemo suddenly went from virtually impossible to kinda squishy, and the game was over quickly enough). Zola brings us to our final keyword, Abomination, which gives the villain a boost to their fight rating equal to the hero’s printed fight rating below its space in the HQ. Zola himself gains a bonus equal to the total fight rating of all heroes in the HQ. It’s petty nasty, though can be highly situational, as if you get the Abomination villains above heroes who don’t have a fight rating, they’re kinda average. This is a pretty great expansion, if for no other reason than it gives us the Winter Soldier, one of the most compelling characters in the Marvel universe! The Captain America 1941 hero-set has some of the classic comics art from the golden age, I’m not a fan myself but I’m sure plenty of fans will appreciate. 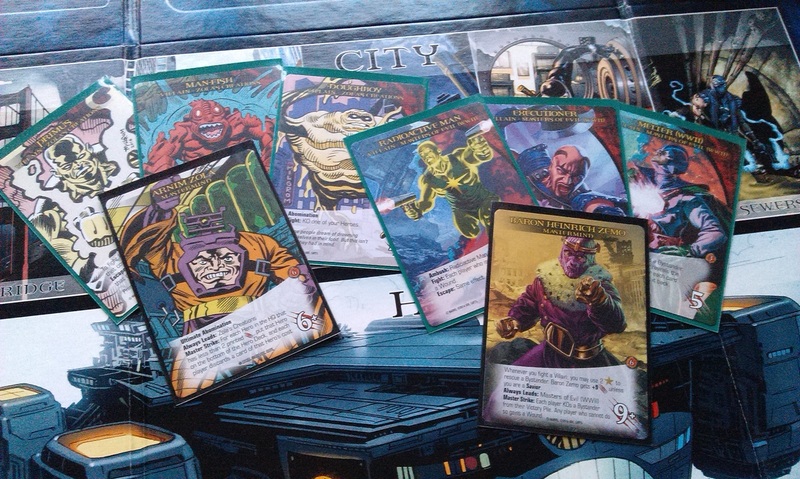 The smaller expansions for Marvel Legendary have all been really great, and at the price, it’s hard to find anything bad to say about them – £20 for 100 cards, five new heroes, two masterminds each with a new villain group, and four new schemes. I mean, what’s not to like?! Even with the base game, you get a great variety to the game. Definitely recommended! 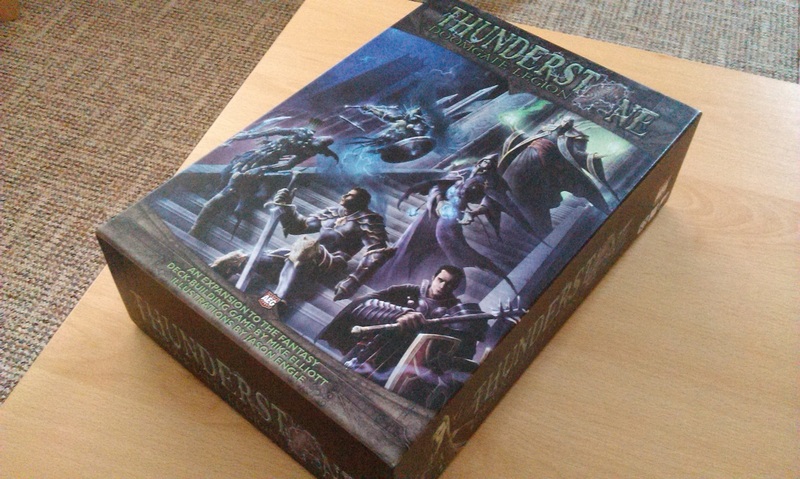 It’s time for another game day blog here at spalanz.com, and today I’m returning to an old favourite, Thunderstone! Having already looked at Wrath of the Elements and Dragonspire, it’s time for Doomgate Legion! This expansion was released in 2010, as the second expansion to the deck-building game (preceding Dragonspire, which actually came out the following year). Much like the earlier expansion, it very much offers more of the same in terms of heroes and village cards, as well as enemies to fight in the dungeon. However, there are a couple of things that are worth pointing out, so let’s take a look! First of all, we have the Swarm enemy. 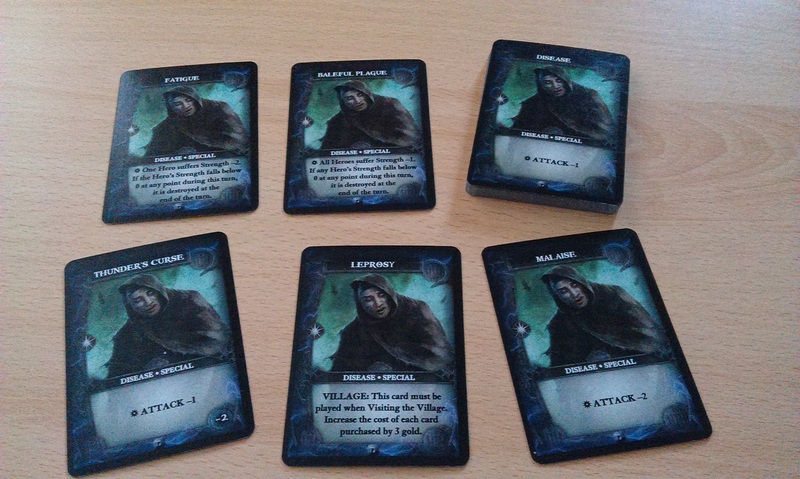 This is a deck of cards that is placed off to the side, with another deck of placeholder cards that is shuffled into the dungeon deck when the game begins. The deck off to the side is made up of an increasingly-difficult enemy type, which is revealed whenever a placeholder card is turned over from the dungeon deck. It’s the same as the Horde enemy from Wrath of the Elements, though I really like this idea, as it can often be hit and miss whether you can actually defeat an enemy in the dungeon. Now, there’s usually more of a chance you could actually prevail! Great mechanic, I have to say, so it’s nice to see it back! 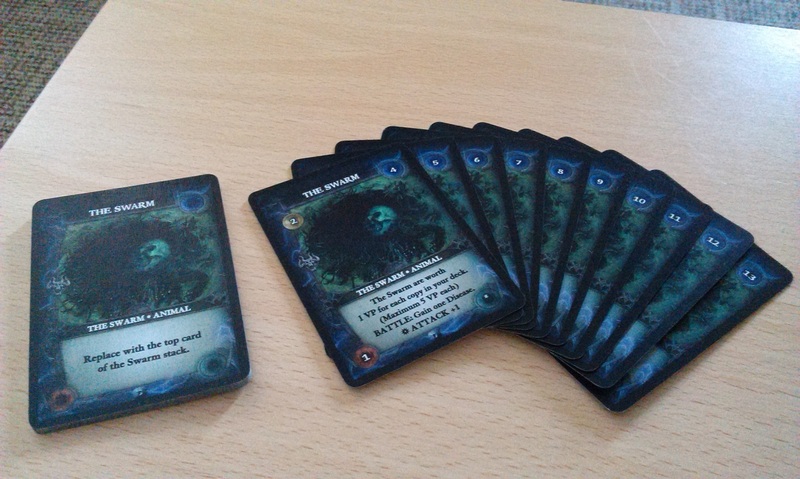 The disease deck also gets something of an overhaul here, with some “special” diseases mixed into ten of the more regular diseases we know and hate from Thunderstone. The remaining fifteen comprise three copies of five new diseases, which is an interesting way to make the game more difficult for the more seasoned dungeon-delver. 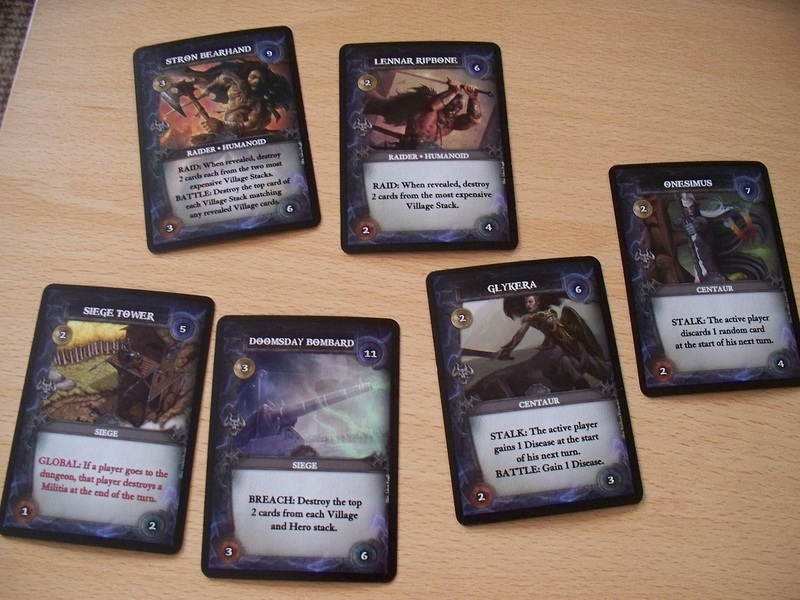 Thunderstone comes across as something of a generic fantasy deck-building game, but while you can enjoy the heck out of it in that way, there is also a story attached to the game. In the first expansion, you fight your way through Dreadwatch Keep as you try to find the Stone of Agony. Here, you’re battling against the Doomgate Legion as you search for the Stone of Avarice, and the enemies are the secretive members of this cult-like order. In addition to enemies, we also have Treasure cards that later turned up in Dragonspire, though I didn’t really delve into what they do in that blog. Mainly because it’s fairly straightforward – the cards get shuffled into the dungeon deck as normal and, when revealed, you immediately gain that item and place it face up in your play area. It doesn’t get shuffled into your deck, however, and you can use it later for a specific benefit, such as bolstering your attack. Pretty decent, though the card is destroyed to use it, and for one-time effects, they aren’t exactly world-beating. But still, the variety is always good! We also have Guardians, who were first seen in Wrath of the Elements. Overall, it’s a nice little expansion. I really like the theme from this one, which feels more apparent to me than previous expansions. As with all my Thunderstone blogs, this is more of a retrospective than a recommendation to buy the game, as it’s been out of print for a number of years already, but Doomgate Legion is actually still available at the time of writing for less than £30 on amazon! It’s definitely worth snapping up if you haven’t got the game already! Author spalanzPosted on August 16, 2016 August 15, 2016 Categories board gamesTags AEG, card games, deck-building games, ThunderstoneLeave a comment on Join the Legion! Tuesday means just one thing here at spalanz.com: boardgames! 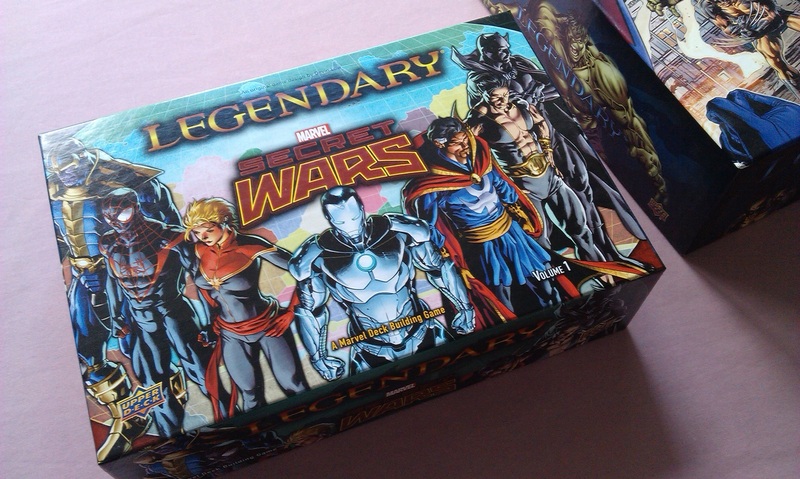 Today, I’m taking a first-look at one of the big-box expansions for Marvel Legendary: Secret Wars volume one. It’s an expansion that came out almost a year ago now, in support of the Secret Wars storyline that was Marvel’s thing for 2015. 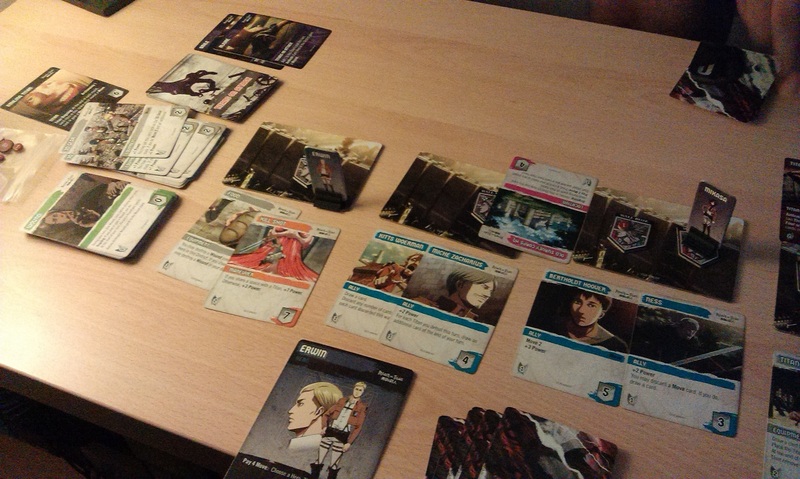 Not knowing anything about that storyline, I was nevertheless intrigued by the look of a lot of the cards and mechanics, though have only now gotten round to playing with the game! In true big-box expansion style, there are a whole load of new cards – 350, according to the back of the box! In addition to the ‘more of the same’ heroes and villains and masterminds, we get a couple of other interesting twists that I’ll get to shortly. The superheroes of the game are predominantly divided into The Illuminati and The Cabal, which sounds really intriguing to someone who doesn’t know what either of those things mean in the Marvel universe! There are also Avengers and X-Men, and a new Spider-Man, so there’s a broad spectrum there. The four masterminds are really odd, however, and have kinda fired my interest to see just what the storyline was about! We have a zombie Green Goblin, a wasteland Hulk, a “goblin queen” Madelyne Pryor, and a “super sentinel” called Nimrod. All very interesting! It’s important to note that some of the artwork – and perhaps, some of the concepts – is from the original Secret Wars event that ran throughout Marvel comics in the mid-1980s, which I’m slightly dismayed to note means it’s roughly as old as I am… Anyway! From what I’ve seen thus far, there aren’t any massive changes to game play, you just do as you always do in this game, recruiting heroes and fighting villains, all the while trying to stop the mastermind before his scheme goes off. They have made a few small changes to the way the game can play, of course, by enabling some villains to become a second mastermind if they escape! Looking at the Wasteland Kingpin card in the above picture, you can see he has a Master Strike ability, which will trigger if he has escaped and is placed as a second mastermind. These new bad guys don’t replace they current mastermind, but rather act in concert with him, meaning you need to fight extra hard to win! While this didn’t trigger in the game I played, I really like the idea, and I hope that we see it happen on future villain groups, also! A new bystander is added to the game, a Banker, who gives you recruiting power when you rescue him, but only to buy a hero below the bank. A new small deck of cards is also added, Sidekicks, who allow you to return them to the Sidekick deck to draw two cards. You can only buy one per turn, though Black Panther’s rare card allows you to just gain three of them, and they can prove to be really, really useful when you need to dig through your deck for the better cards! I also thought this new deck was super thematic, as a Sidekick is basically providing you with a modicum of help without being too overpowering in and of itself. Time for the big change to the game: the one vs many mechanic. 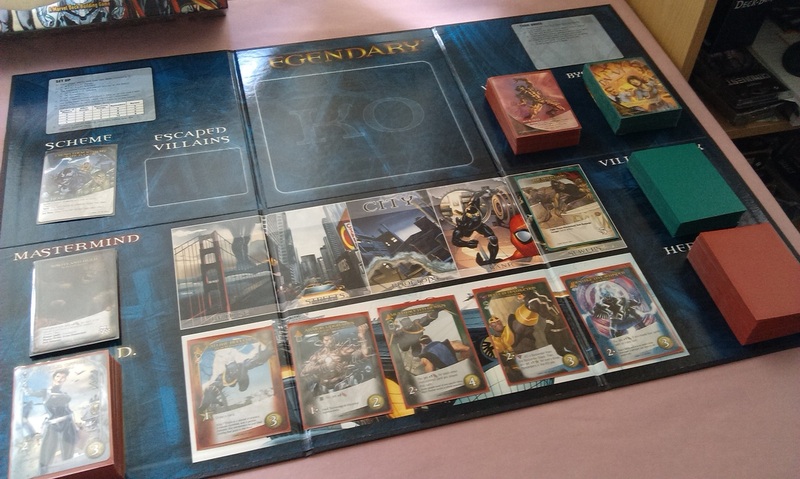 Marvel Legendary is a co-operative game, where the players work together to overcome the evil mastermind and win. However, in the manner of Descent, you can now have a player take on the role of that evil mastermind, and actively work against the players! The mastermind player has a deck of Ambition cards, though he does also get a starter deck of SHIELD agents like the regular players. 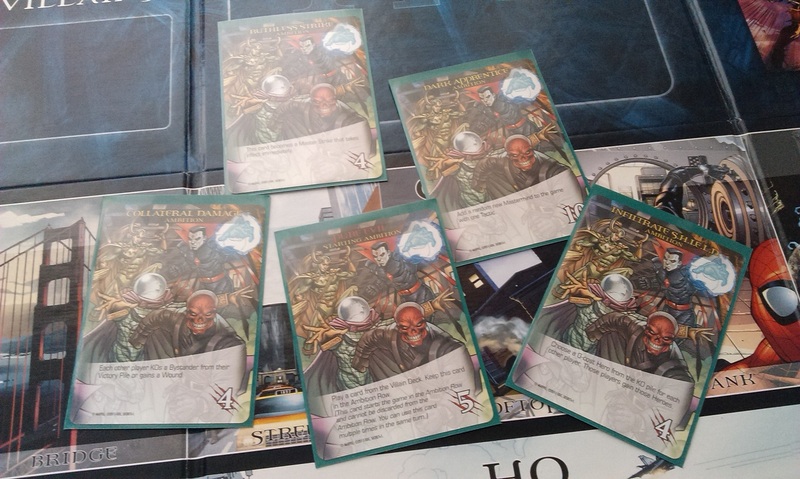 On his turn, the mastermind flips over the top of the Ambition deck rather than the top of the villain deck, and places it face-up in an Ambition row. 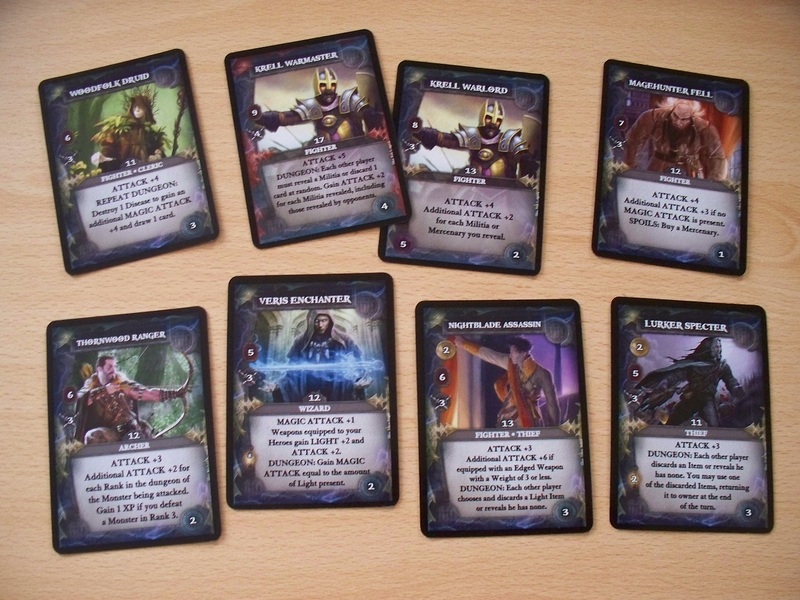 He can spend the attack points to play any of these Ambition cards, which have a universally bad effect for the hero players, but the mastermind player can still recruit heroes and defeat villains if he wants to. I haven’t tried this mode, and was only able to summarise it above by reading what the rules sheet has to say on the subject. My first impression of the mode is that it feels distinctly tacked-on, though it’s probably the best way to implement such a mechanic onto an established game. To be blunt, there isn’t really any meaningful interaction between the regular players and the mastermind player: the ambition cards are basically ways to mess with the regular players, but the players will likely know what the mastermind is going to do because they can see all four ambition cards at all time in the row. I imagine this mode would see the regular players just carry on as they always do, with the odd collected groan if the mastermind then plays a card that forces them to discard all of their attacking superheroes, for instance. But there’s no way to stop them on their turn, and it just feels a bit like the mastermind would be a marginal player in the game. Maybe it plays completely differently, though, so I suppose I’d have to try it first. It’s worth mentioning that this is only volume one, and there are a few more Ambition cards in volume two (which I have played previously, and will hopefully get round to taking a look here soon!) These new cards do much more interesting things, though are still in the vein of messing with the regular players rather than the more directly interactive stuff. But I think I might be expecting too much from the mode of play, and as I said above, it’s probably the best way this could be implemented. There’s a definite flavour that comes out of this box, and it definitely makes it worthwhile for a purchase. I’ve already said that I don’t really know anything about the storyline, but this didn’t really impact on my enjoyment of it, though I would imagine that knowing the story would have a distinct advantage as you could get some really flavourful villain and hero groups going on there. I have played with volume two, and this will have its own blog, but I’m not sure how the two fit right now, if indeed they do at all, as there are distinctly different themes from the second box. All in all, really enjoyable to play, and definitely worth getting if you haven’t already done so! Alchemy was the first small-box expansion for the game back in 2010, and introduces a new resource to the game: Potions. Potions cost 4 gold, and come into play when you’re looking to buy some of the particularly powerful cards that form a strategy of top-deck manipulation. There’s also the new victory card Vineyard, which is worth VPs for each 3 action cards in your deck at game end, which can be particularly good for rewarding you for getting cards you need to play the game anyway. However, you don’t want to go buying up all the Potions cards as you would the big money cards, as you still need the gold to make them work for you. It’s an interesting expansion, though probably not one you want to mix in with other expansions. Hinterlands is another interesting expansion, though a curious one, at that. I once read a review that called it “the Dominion players’ expansion”, which fits quite well, really. There is a broad theme of orientalism in the box, though in terms of mechanics, it’s just filled with interesting cards that bring about some interesting gameplay decisions. There’s no over-arching strategy to speak of, you just get more of the same but in a sort of niche way – it’s the sort of expansion you’ll want if you already own several expansions, but not if you’re looking to get your first. Ironically, Hinterlands was actually my first expansion for the game, bought primarily because I was interested in that orient flavour. Dark Ages professes to be all about the trash, and all about the upgrade. Rather than Estates, players start with the Shelter cards in their hand, which provide you with bonuses when you trash them, allowing you to do stuff right off the bat. There are two cards that allow you to gain new cards when trashed, Urchin (to gain a Mercenary), and Hermit (to gain a Madman). These new cards can be quite powerful, but won’t stay with you for long. There are also Rats cards that can overrun your hand, which I find quite thematic! A lot of the cards in Dark Ages have a sort of dingy, “used-up” feel to them. In a sense, this is the antithesis of Prosperity, where everything is new and shiny and expensive. It’s quite a nice feeling, in a weird kinda way! This is nowhere more plainly seen than in the Ruins cards – five sets of ten different cards that evoke earlier versions, such as Ruined Market or Ruined Library. These cards have a 0 cost but are generally not as good as other cards on offer. But at least they will allow you to get something you can later use if you’re running short of money. Continuing the theme of trash-interaction, there are cards that directly work off the trash pile, including the Rogue, which actually allows you to take a card from there. Some very interesting concepts and ideas available here, anyway! I actually found it took some getting used to this one, and would probably recommend playing some of the others first. Finally, we have Guilds. Released back in 2013, at the time this was said to be the final expansion to the Dominion game line. It’s another that comes with metal coin tokens (shiny! ), and features a new mechanic around overpaying for stuff. The coin tokens are therefore used to facilitate overpaying to gain maximum effect without spamming your deck with gold cards. A lot of positivity came out of this box, largely due to the theme of overpaying and such. Because you will likely go through the game gaining a lot of gold, it’s also one that combos well with Prosperity and all those big money shenanigans. A wonderful addition, at any rate! As a postscript, let’s talk briefly about the new Adventures game that came out earlier this year. Some new card types come in the shape of Event cards, which grant an effect when purchased, and Reserve cards, which can be set aside for when you need it most. Duration cards make a return (originally introduced in Seaside), and there is a Traveler card that can be upgraded much like Dark Age’s Urchin/Mercenary or Hermit/Madman combo. It sounds like another solid expansion, at any rate, though I haven’t bought it so don’t know how it actually plays. But there you have it! 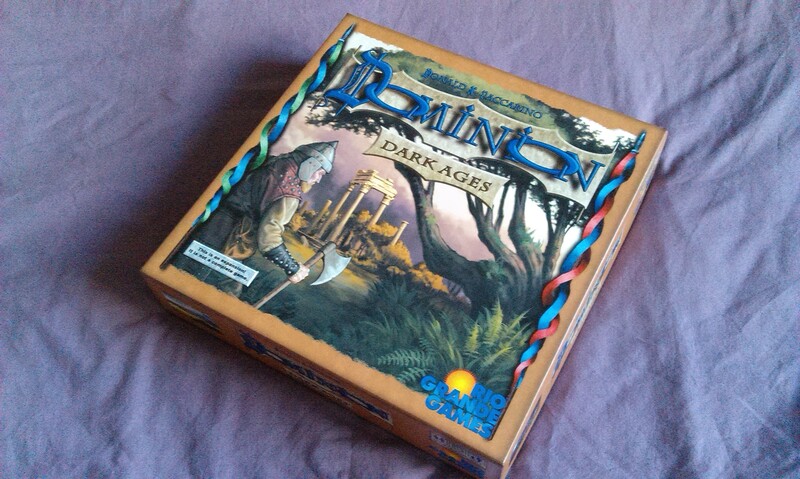 The full trawl through the game line of Dominion. 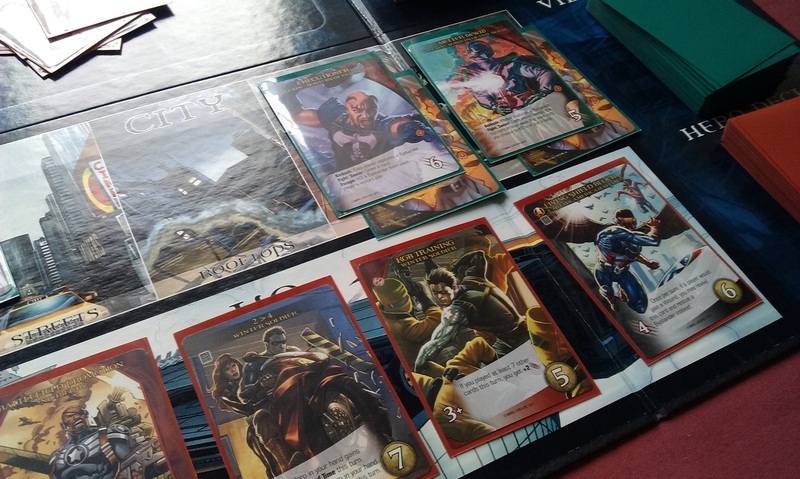 I must admit to feeling fairly tired of the game these days, as I find myself sticking to the more thematic deck-building games such as DC or Marvel Legendary. I’ve had some fun with Dominion, don’t get me wrong – it can be really awesome when you set up a mega-combo that lets you buy half a dozen cards and draw most of your deck, for instance. But ultimately, it’s still just down to basic mechanics, without much in terms of theme coming through. You buy cards for their in-game effects, and nothing else, so it can be quite mechanical. Sure, some cards will have that flavour about them – Market forever springs to my mind – but I don’t feel it in the same way as I do with other games. It’s time for another game day extra, as I decided to catch up with some of the news around upcoming games over the weekend. So sit back and enjoy a look at three games that I’m really intrigued by, due out in the coming months! Of course I’m going to start with something from Games Workshop! There have been rumours of a Deathwatch/Genestealer Cult boxed game coming out from GW for months now, but we finally have enough confirmation that I’m going to talk about it here! I am a huge fan of the Deathwatch – one of the first 40k novels I read was the short story collection, and I’ve always enjoyed the RPG from Fantasy Flight. 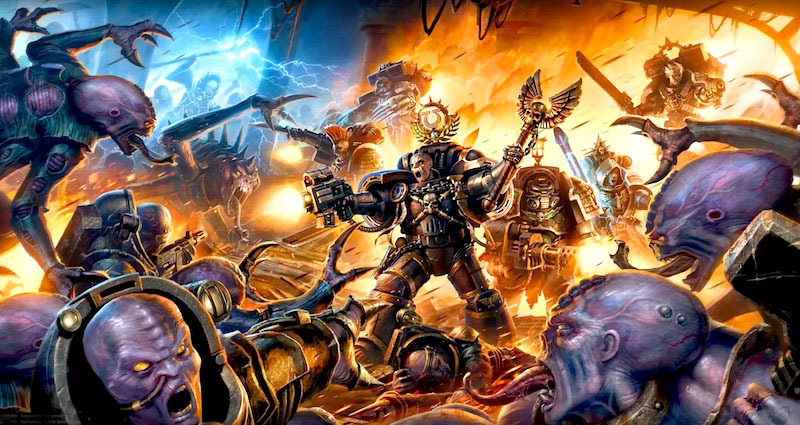 I think the idea of a whole bunch of really great warriors from different chapters working together to purge the xenos just really captures my imagination! The pictures floating around of the Genestealer Cult are a little, erm, odd, but if it gets me some Deathwatch, then I’m in! It’ll be up for pre-order on Saturday, and released on 5 March, so I’ll no doubt have something to say about it then! I’ve bought all of these boxed games they’ve released over the last few years, but this is the first one I feel that I really want to build up and paint to play the actual game, even though the details of it are still unknown. I simply want Deathwatch marines! This has been the next big thing from Fantasy Flight for a while now, and a few weeks back they essentially had a publicity week where the only news published on their site was a series of previews for this. When it was first announced, I wasn’t particularly chomping at the bit for it, I have to say. It looked a bit too messy, and I was worried it might be a huge time sink, the sort of game that you spend all night playing, only to feel like you would have been better off playing a lot of smaller games. At any rate, I wasn’t exactly going to drop £80 or whatever it turns out costing me on day one. However, the more I’ve seen of it, the more I’m beginning to revise that opinion somewhat. The game looks like a juggernaut, there’s no denying this, but it looks like the kind of game that I would really enjoy sitting down for a few hours to pit myself against my opponent. There are actually very few games that I like that are both long and competitive. So while I still might not actually buy it on day one, I’m nevertheless changing my entire viewpoint on this one now, and may well be investing later this year! 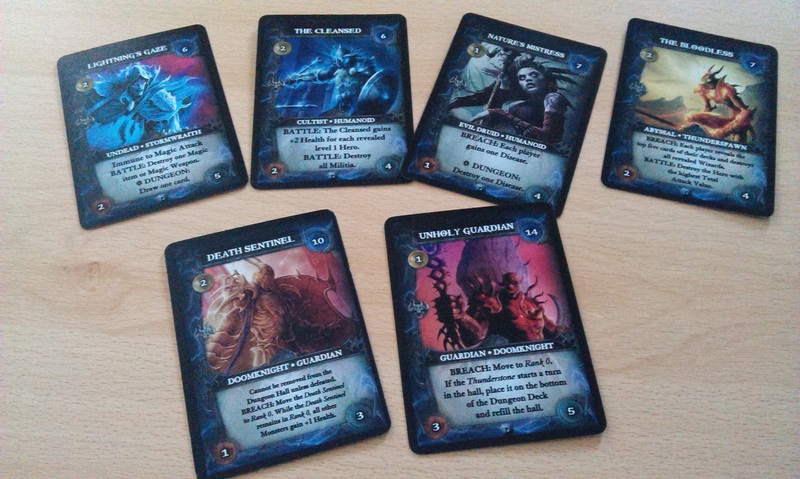 A deck-building game coming in May, Tyrants of the Underdark pits players together as the drow houses of Menzoberranzan! This sounds really cool, as you play members of the ruling houses trying to control the most of the Underdark by the game end. I really like this idea, and while I’m not quite sure how it would work as a deck-builder – I think I’d prefer to see a more traditional CCG/LCG style of game, where each house feels different rather than just all being able to use the same cards – it’s still very exciting, I’ve got to say! So those are three of the most-anticipated games, for me, that are due out in the coming weeks and months! Author spalanzPosted on February 23, 2016 February 21, 2016 Categories board gamesTags board games, card games, deck-building games, Dungeons and Dragons, Fantasy Flight Games, game day extra, Games Workshop, new games, Star Wars, Warhammer, Wizards of the Coast2 Comments on Upcoming Games!